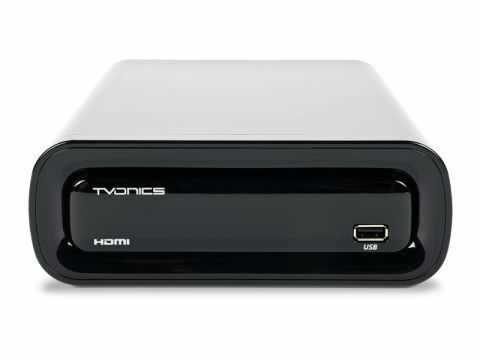 Surprisingly, the TVonics DTR-HV250 is the first Freeview PVR from TVonics to sport an HDMI output, which enables hi-def TV owners to savour the delights of upscaled Freeview programmes. But in our eyes, a bigger selling point is the eye-catching design and superb build quality. It's compact enough to squeeze into cramped AV racks, while the curved edges lend a touch of style missing from most PVRs. For the bodywork, TVonics favours aluminium over plastic and the gloss black finish makes it pleasingly fashionable. The display panel on the front helpfully shows the name of the programme and then the name of the channel. Aside from an HDMI output, you also get two inputs, effectively turning this unit into an HDMI switchbox. This is a first for a Freeview PVR, and is great news if you only have one HDMI input on your TV, because you can flick between Freeview, Blu-ray and Sky HD without having to keep swapping cables. The RGB Scart output is useful if you want to make back-up copies of favourite TV shows. There are two USB ports (one front and one back). Connect a USB memory drive or card reader to either one and you can view JPEG photos on your set. There's a 250GB hard disk on board that holds up to 125hrs of recordings, while twin Freeview tuners enable you to watch one channel and record another, or record two channels simultaneously. Unlike the Humax PVR-9300T, the unit stops you watching a third channel while recording two others, no matter what multiplex it's on. Freeview+ features such as series link, split recording and pause live TV are as welcome as ever, while the useful picture-in-picture mode enables you to view other channels in a small box that can be moved to any corner of the screen. The onscreen design doesn't seek to wow you with fancy graphics or elaborate layouts. As per previous models from the same brand, simplicity and practicality are top priorities, which explains the use of plain boxes filled only with lists and minimal submenus. It's a joy to use, and will suit elderly users or Freeview first-timers. Also impressive is the way the box guides you through any potentially tricky situations, and does so using plain English. For example, when you schedule a recording that clashes with others, up pops a dialogue box that asks if you want to 'Resolve Conflict' or 'Cancel Timer'. The former option shows a list of the recordings in question to choose from. Compare this with some of the clumsy, pidgin English Freeview+ recorders we've encountered and the DTR-HV250 really does stand out. The EPG is slick and simple to use. It shows nine channels at a time with an array of functions at the bottom, but doesn't feel cluttered. Series Link is easy to set – if available, it pops up as an option when you set a recording in the EPG. But when it comes to channel surfing, the coup de grâce is the information banner, which lets you search any channel and any time, not just 'now and next' details. The recording library continues the user-friendly theme with a no-frills list of programmes. The list can be arranged by name, date or duration and once selected you can view a recording from the start or choose where to start playback, just like Sky+. Comparisons to the latter extend to the remote control, which uses a very similar layout. Is this laziness from the maker? Perhaps, but it's also rather shrewd, given the universal love for Sky's zapper. TVonics' effort feels more plasticky, but thanks to the thoughtful button arrangement and clear labelling it poses no problems. Picture quality is the DTR-HV250's Achilles' heel. Live Freeview images upscaled to 1080i are watchable enough, but they suffer from a gauzy effect that clouds the clarity, plus every now and again the picture stutters uncomfortably, and even appears to slow down as if the video processing is struggling to keep up. The situation isn't particularly improved by changing the resolution to 576p, either. On the plus side, colour depth is fine and recordings look identical to the live broadcast, although sadly it doesn't clean up those artefacts when capturing video on the hard disk. But in other respects the unit performs well: channel tuning is fast, the tuners are robust, channels change instantly and digital text pages load up in a flash. The clear, dynamic stereo sound bursting from our speakers reveals no problems on the audio side. The inclusion of an optical digital audio output makes it easy to send the signals to a Pro Logic II-enabled amplifier and heighten the excitement of drama shows and movies, but the Scart and HDMI outputs provide equally clear sound quality. The results are equally good whether you're watching live or recorded programmes. The DTR-HV250's price tag might put it beyond the reach of some buyers, but on the whole it justifies the outlay. Its main asset is a fantastic feature list, which includes HDMI switching, a sizeable hard drive and a range of Freeview and recording functions that goes beyond the norm. It's also incredibly simple to use, but sadly its below par picture quality lets the side down and puts a big dent in the overall value.